Last week, I attended NRF 2018 in New York, where I had the opportunity to see cutting-edge retail technologies, talk with people throughout retail about how our industry is changing, and show Intel’s efforts to redefine retail. Retail’s Big Show was certainly big this year, and Intel had a large presence. Our booth featured eight product demonstrations, including many related to AI and computer vision. The retail technology ecosystem we’ve helped create was on display, with over 30 of our partners showcasing retail solutions enabled by Intel technologies. And Intel’s vision for what’s possible for retail through technological innovation was also represented by the vice president and general manager of our Retail Solutions Division, Joe Jensen, on a panel discussion called Robotics and AI: Trailblazing technology for future retail. It was a busy few days, and it was exciting to see the technology trends that emerged. What stood out to me at NRF 2018? Some impressive new technologies that are improving retail for both retailers and consumers. Artificial intelligence has been playing an increasingly large role in retail, and that role was certainly on display at this year’s event. Technology innovators are coming up with new ways to enhance analytics using AI, often enabling actions in real time. At Intel’s booth, we had several AI retail solutions on display. For example, boutique candy purveyor Lolli & Pops showcased how they can improve the shopping experience for loyalty members using computer vision technology. Their shoppers are automatically recognized when they enter a store, and then AI-enhanced analytics access member preferences so associates can make personalized recommendations. AI and computer vision cameras are being used for many purposes. For example, SpotCrowd technology relies on facial recognition enabled by AI to identify shoplifters and prevent theft. This solution was selected by Getting to Global as one of the most disruptive, innovative startups at the event. Bossanova's roving robots make continuous shelf monitoring possible. Robots have arrived in retail, and it turns out they’re pretty useful. 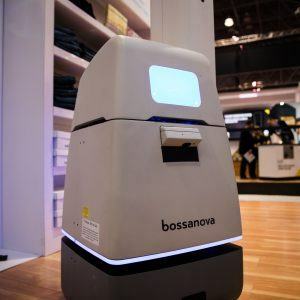 Take Bossanova’s shelf-scanning robots, which were showcased at the event. These robots circulate throughout stores and scan shelves continuously using Intel-powered computer vision technology integrated with RFID. Retailers can benefit significantly from tech like this because it frees up store associates to focus on customer service. It also makes it possible to gather inventory data all the time, not just when employees have time for it. This type of automation is growing in retail, and I expect we’ll see more of it—and more retailers investing in it—in the years to come. NRF 2018 demonstrated the significant strides technology has helped retailers make to improve their supply chains. Inventory tracking and management can happen continuously now, which makes it possible for businesses to make smarter, faster decisions to prevent stockouts and other problems that lead to dissatisfied customers. For example, G-Star uses Intel Responsive Retail Sensors and real-time POS transaction data to provide a better picture of inventory and of what’s actually selling. This data enables insight-based decision-making about what each store should have on hand. The Hershey Company uses AWM Smart Shelf, another shelf management technology on display at the show, to gather data about shrinking inventory and shopper statistics. This information helps retailers ensure customers find what they want on shelves. Personalization certainly isn’t a new concept in retail. Numerous technologies on display at NRF 2018 showed how retailers can customize the shopping experience. MemoMi's Memory Makeover lets customers take their makeover with them. Attendees saw MemoMi’s Memory Makeover, which is used by Neiman Marcus. 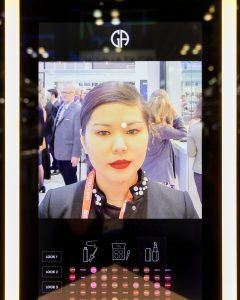 This tech lets customers recreate personalized in-store makeovers by recording them and sending them to their phones. That way customers can remember what products were used and how they were used, and retailers like Neiman Marcus can get a better sense of what their customers want. Many booths at the event showcased personalization, including tech that personalizes signs, music, and product recommendations. Customizing the shopping experience as much as possible benefits all retailers, and it was exciting to see the innovative ways retailers and tech companies are making this happen. Adopting new technology can be daunting, but at NRF 2018 there were plenty of examples demonstrating that companies aren’t afraid of trying new things. Because customer demands are always changing, retailers know they need to find effective ways to keep up. That’s why we’re investing in many facets of retail technology to help redefine the industry as one that’s modern, tech-savvy, and in tune with consumer and market trends. 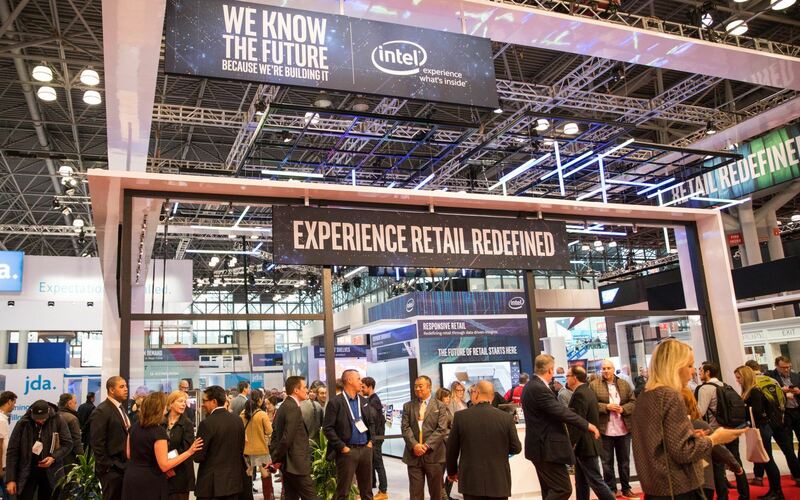 If you’d like to learn more about Intel technologies seen at Retail’s Big Show or about how responsive retail technology can help your business, visit our website. You can also hear more about the event and other news in the industry at the IT Peer Network.